Monday, October 18, 2009 to December 2, 2018 and still going! Thanks to all my loyal customers. We are here to serve your curtain & drapery hardware projects, small and large. https://johnson.basicq.comDrapery finished with equals curtain rod width plus overlap plus returns. Overlap is the part of the panel that rides the master carrier ond overlaps the other drapery panel in the center when the draperies are closed. 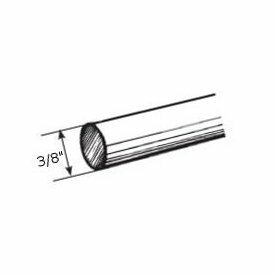 A general rule is to allow 2 1/2 to 3 1/2 inches per drapery panel on a two way draw traverse rod. Overlap is not needed on a one way draw or shirred pocket installation. Fullness defines the amount of fabric that is pleated or shirred for a given drapery finished width. Fabric weight and personal preference determine fullness. Projection is the distance from the wall to the front of the curtain rod. Clearance is the distance from the wall to the back side of the curtain rod. Returns are the amount of drapery that covers the distance from the front of the curtain rod to the wall.